The other day, G-LO suggested that I come over to do a “quick” review. Not surprisingly, the “quick” review involving a single beer devolved into reviews of two additional whiskies, and then a few more drams just for good measure. Well, before the whisky nonsense, we sampled the Innis & Gunn Toasted Oak IPA. Innis & Gunn, a brewer based in Edinburgh, Scotland specializes in producing a range of beers that are aged in casks. They use a variety of woods in their product line. We have already had several of the Innis & Gunn lineup (most notably the Original, the Irish Whisky Cask, the Rum Cask and the Rum Aged). 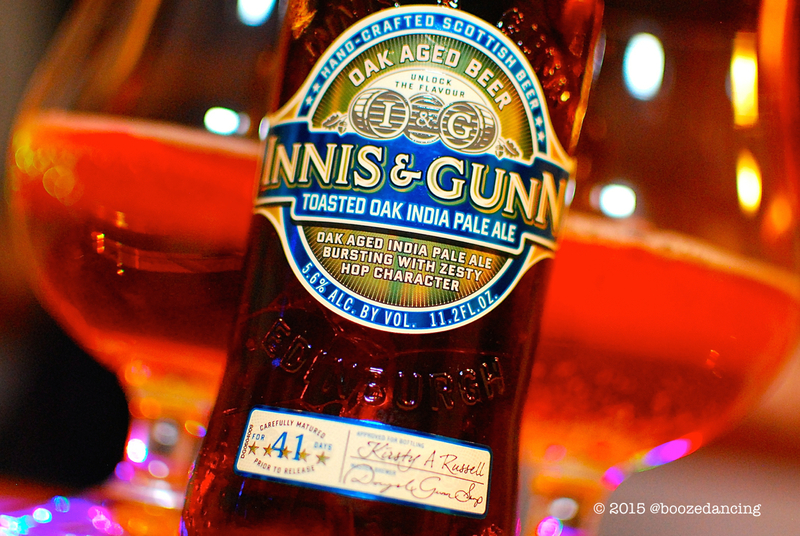 The Toasted Oak IPA is Innis & Gunn’s foray into India Pale Ales. The beer is brewed using three varieties of hops and then is aged for 41 days over lightly toasted American Oakerators®. India Pale Ale first made its name in the 19th century. Here’s hoping our pioneering IPA can make its mark too. Its fervent hoppy character hails from the unique addition of large quantities of hops at three separate points during brewing. The result is a beer that’s rounded yet refreshing, with delicate floral notes and oodles of zesty freshness. Appearance: G-LO was very helpful and noted that it was either a pale orange or golden honey with an orange hue. Thanks for that overly descriptive bit of indecision. I would say that it’s clover honey colored. Limpd: Almost too light. A bit like a softly scented hand soap – herbal and little woody. G-LO: I thought that we should have let this warm up a bit because the nose was quite muted when poured right from the fridge. After 20-30 minutes, it opened up a bit. [Editor’s note: Once it opened up, G-LO went a bit off the rails and got all “The Chew” on me (whether he’s Michael Symon or Mario Batali is still up for debate)! He started prattling on about various flavors and notes and the seasons in which things were grown and the type of soil and the amount of sunshine and rain. To be honest, I started to zone out, but I digress. What a douche!] I’m getting some orange marmalade, caramel, and a good bit of vanilla. Limpd: Crisp, clean and easy drinking, but, it’s a bit unremarkable. It’s good but not great and lacks the oomph of a traditional IPA. G-LO: Lightly carbonated. It starts off a little bitter (much like G-LO) with some light citrus coming through. Very mellow overall (more like me) with a bit of caramel sweetness coming through at the finish. The finish is crisp and clean with just a touch of lingering bitterness (also like G-LO). Limpd: I’ve really liked some of the other beers in the Innis & Gunn lineup. This one just didn’t do it for me. It was almost too soft without any of the hops or citrus that I have come to expect in an IPA. G-LO: I wasn’t too impressed with this beer. When I see IPA, I expect some citrus, pine or earthiness, but this beer has none of that. Maybe my disappointment has more to do with my high expectations and not with the actual beer. Either way, I will once again skip this one and go back to the Innis & Gunn Original. Many thanks to Savonna Communications for sending us this sample!